Pet Sematary Facts – from "Stephen King Books"
Fabrizi, Mark A. "Reading the Cool Stuff: Students Respond to Pet Sematary." Reading Stephen King: Issues of Censorship, Student Choice, and Popular Literature Ed. Brenda Miller Power, Jeffrey D. Wilhelm, and Kelly Chandler. NCTE. Urbana, IL. 1997. pp. 139-147. 2L, Estelle. "Simetierre" Svoong: Summaries and Short Reviews. English translation - "Pet Sematary"
Lehmann-Haupt, Christopher. 'Pet Sematary' (review). New York Times. October 21, 1983. Smith, Michael Marshall. 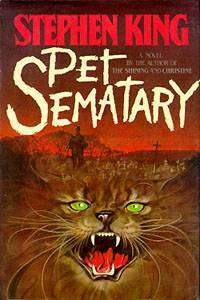 “Michael Marshall Smith on Pet Sematary by Stephen King .” Horror: Another 100 Best Books. Ed. by Stephen Jones & Kim Newman. Running Press. 2005. pp. 301-305. Winter, Douglas E. "Pet Sematary By Stephen King" Washington Post. Book World; Pg. 1. November 13, 1983. Castricano, Jodey. "'Darling,' it said: Making a Contract with the Dead." Cryptomimesis: The Gothic and Jacques Derrida's Ghost Writing. McGill-Queen's Press. 2003. * An examination of the intersection between the writing of Jacques Derrida and the Gothic. Doesn't really illuminate much about Pet Sematary. "The most successful articulation of this theme in Cryptomimesis is found in an astonishing interpretation of Steven King’s Pet Sematary. Castricano provides not so much a Derridean reading of King as a Kingian reading of Derrida. “In King’s novel,” Castricano argues, “the dead return not only because they were not properly buried but also because they represent, in Derridean terms, a certain remainder.”"
Corstorphine, Kevin. "'Sour Ground': Stephen King’s Pet Sematary and The Politics of Territory." The Irish Journal of Gothic and Horror Studies. Issue 1, October 2006. Csetenyi, Korinna. “Bringing Back the Dead: Stephen King’s Pet Sematary.” Hungarian Society for the Study of English 9 (HUSSE 9) Conference – Jan. 2009. Flint, Christina. "Stephen King: More than gore?" The Daily Collegian. University Park, PA. Feb. 9, 1993. Heller, Terry. "Love and Death in Stephen King's Pet Sematary." Department of English--Coe College. Cedar Rapids, Iowa. 2001. Magistrale, Tony. "The Shape Evil Takes: Hawthorne's Woods Revisited" Stephen King. Ed. Harold Bloom. Chelsea House. Philadelphia, PA. 1998. pp. Mustazza, Leonard. "Fear and Pity: Tragic Horror in King's Pet Sematary." The Dark Descent: Essays Defining Stephen King's Horrorscape. Ed. Tony S. Magistrale. Greenwood Press. Portsmouth, NH. 1992. pp. 73-82. Pharr, Mary Ferguson. ”A Dream of New Life: Stephen King’s Pet Sematary as a Variant of Frankenstein.” The Gothic World of Stephen King: Landscape of Nightmares. Ed. Gary Hoppenstand and Ray B. Browne. Bowling Green State University Popular Press. Youngstown, OH. 1987. pp. 115-125. Quigley, Kev. "...sometimes, dead is better..." Charnel House: The Stephen King Site for the Discerning Reader. April 25th, 1998. Reino, Joseph. "Impossible Cars and Improbable Cats: In a Misspelled Cemetery." Stephen King: The First Decade, Carrie to Pet Sematary. Twayne Publishers. Boston, MA. 1988. pp. 92-99. Schroeder, Natalie. "'Oz the Gweat and Tewwible' and 'The Other Side': The Theme of Death in Pet Sematary and Jitterbug Perfume." The Gothic World of Stephen King: Landscape of Nightmares. Ed. Gary Hoppenstand and Ray B. Browne. Bowling Green State University Popular Press. Youngstown, OH. 1987. pp. 135-41. Strengell, Heidi. "Frankenstein's Monster: Hubris and Death in Stephen King's Oeuvre." Department of English, University of Helsinki. Weinstock, Jeffrey Andrew. “Maybe It Shouldn’t Be a Party: Kids, Keds, and Death in Stephen King’s Stand By Me and Pet Sematary”. The Films of Stephen King: from Carrie to Secret Window. Ed. by Tony Magistrale. Palgrave Macmillan. 2008. Winter, Douglas E. “Pet Sematary and the Paradox of Death” Literary Companion to Contemporary Authors - Stephen King. Ed. Karin Coddon. Greenhaven Press. Nov 2003. * Includes commentary by director Mary Lambert, and three excellent extras on the making of the movie and the story behind the story. Bregland, Renée L. The National Uncanny: Indian Ghosts and American Subjects. Dartmouth College. University Press of New England. Hanover. 2000. Looking for the Windigo? - A Great Resource for Wendigo studies. The Windigo – Pretty good account of legend. With links. Roosevelt's Wendigo Story written by Theodore Roosevelt. * Windigo Psychosis; A Study of a Relationship between Belief and Behavior among the Indians of Northeastern Canada - Morton I. Teicher. 1960. All contents © 2005-present by J.L. Benét unless otherwise specified.